← The Rapture: Entertaining, Yes. But Is It Biblical? Bear with me here. 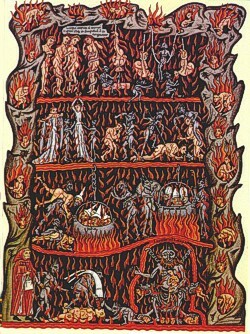 Our modern concept of Hell has nothing to do with the Bible. We have a 14th century epic poem named “Inferno” by Dante Alighieri to thank for that. The Biblical words often translated as “Hell” are “Hades” and “Sheol”. These simply meant the domain of the dead in Greek and Hebrew respectively. It was where both good and bad people were thought to go when they died. What about the name, “Gehenna”? That was the name of the Jerusalem city dump. Clearly, Jesus was using it metaphorically. This entry was posted in Bible and tagged Bible, Biblical, Dante Alighieri, Hell, Jesus. Bookmark the permalink. One trains the eye of confession most closely on what is hurting. If sin is present it will be aching. Confession begins where the raw anguish of conscience is rubbing against the primordial awareness of God's holiness. Kurtis Karr's Blog > Christianity > Bible > Is “Hell” Actually Biblical?